Ages 2-6. Designed for preschoolers and toddlers! 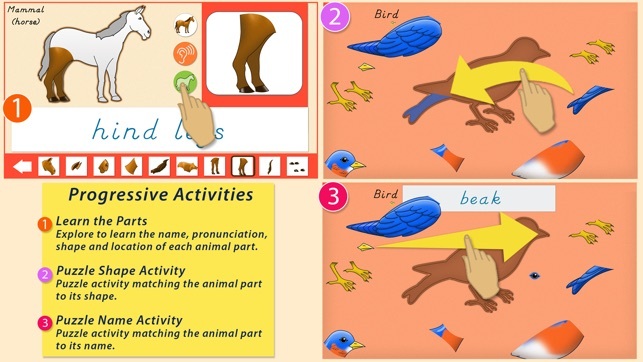 Packed with beautiful features, colors and audio, this app will engage young children to explore what makes a fish a fish, what makes a bird a bird, etc. 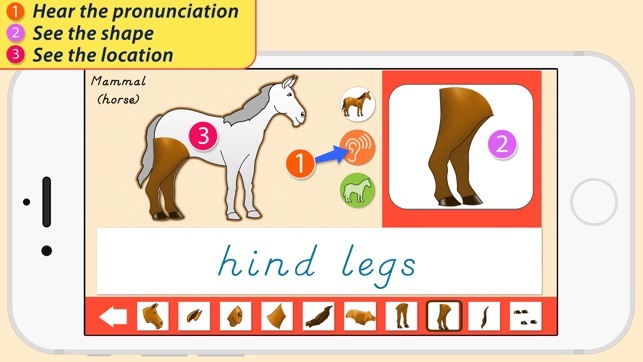 You'll be surprised how much children will learn and retain with this app! We first released it in 2012 and are happy to keep bringing you updates! 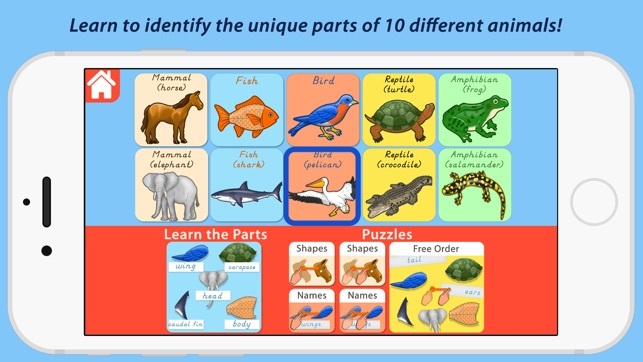 In the Learn the Parts section, children will learn to identify the parts and names of different vertebrate animals. The Puzzles section contains various puzzle activities based on the famous wooden animal puzzles found in Montessori classrooms. For the "Shapes" puzzles, find the puzzle piece the matches the shape that is blinking on the diagram. When the piece snaps into position, you will hear it's name pronounced out loud. For the "Names" puzzles, find the puzzle piece that matches the name displayed on the screen. For children who cannot read, the name at the top can be touched to hear the name aloud for them to know which one to look for. In the "Free Order" puzzle, simply assemble the puzzle in any sequence you choose. 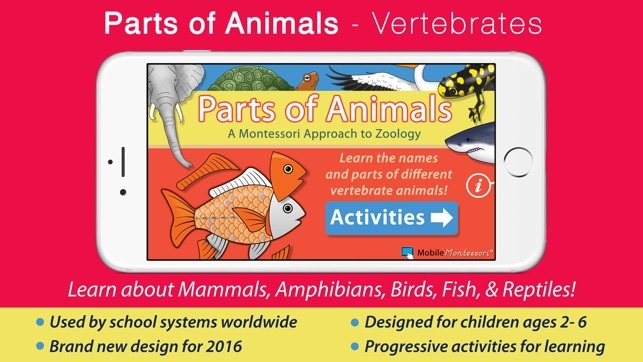 Learn about horses, elephants, crocodiles, salamanders, frogs, turtles, fish, sharks, birds, and pelicans! Parts of Animals looks amazing on the large iPad Pro! Preschoolers and Toddlers will love learning about Science on the big screen! As a certified Montessori toddler, early childhood, and lower elementary teacher I have to say I absolutely LOVE these apps. The subtle music and sounds, and the calmness of the voices fits right into the Montessori style of teaching. Not only do I use all of the apps for my own son at home, but I also recommend them to parents who ask for "homework", or who want to supplement their children's Montessori education further. I understand that some people find the apps too boring for their children, or feel as if their children aren't "stimulated" enough. Montessori education stimulates children by giving them accurate facts to work with, not by overloading their senses with bright colors and animated pictures, or loud music and sounds. 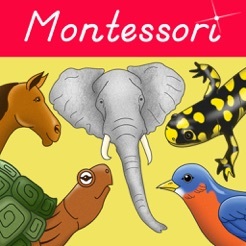 These apps are a great addition to the Montessori curriculum, presenting children with the original tools but in a more modern medium. This app is very engaing for the preschoolers that I work with. They come back to this app again and again. The children love doing these animal puzzles and are learning the names of the parts of the animals as well. This app has several options for building the puzzle; tapping vs. dragging and auditory vs. written clues for which part to move into place next. There is also an option to build the puzzle freely in any order the user desires. I highly recommend this app for preschoolers and kindergartners. 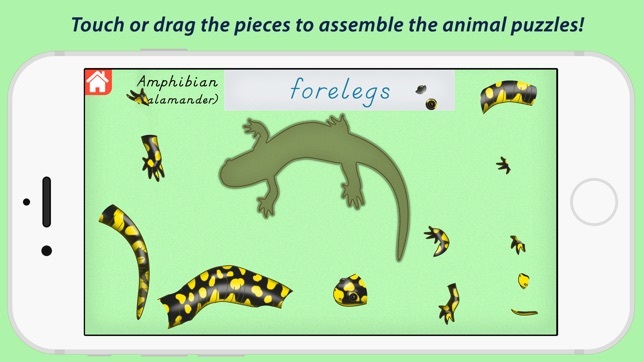 These puzzles complement the vertebrate puzzles found in the Montessori classroom. 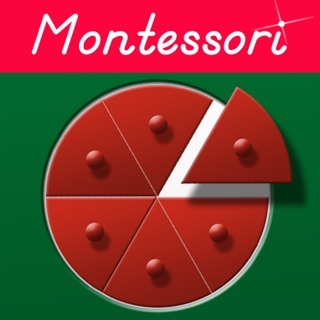 This app would work great for non-Montessori environments, too. The recent upgrades to this app are amazing. This app interface is now more intuitive and much more child friendly. The choices as to which type of puzzle are to do are now very clear. Thanks for taking the time to make your app stellar! This upgrade corrected any and all slight problems I had with this app. I recently bought this app for my seven year old. I really like the fact that it identifies most of the major body parts, but there is only one animal in each animal group, only five different animals in all to be manipulated and learned about in three different ways. This would be an awesome children's app if the creators decide to add some different animals into each of the five animal groups. It would give children a more thorough understanding of the range of species in each animal group. For example, providing turtle and alligator puzzles in the reptile group, etc. © 2016 Mobile Montessori ® by Rantek Inc.